When I was in Nepal, 2nd week of January this year, I experienced and saw the Banda or strike twice. First in Pokhara, when we arrived at the airport last January 11, there were very few vehicles and even motorcycles. There was a banda, a strike called by the Communist Parrty of Nepal (CPN) - Maoist. Lucky that our hotel has a complimentary airport transfer. Other passengers were not so lucky, they have to walk from the airport to their destination. From our hotel, Shangrila Village Hotel, we walked for about 45 minutes going to our destination, Pokhara lakeside, the main commercial and hotel/tourism area of the city. In one intersection, I saw a group of old men holding a flag of hammer and sickle, the CPN-Maoist flag. They were just sitting or standing in that intersection, the Nepal police were also standing on another side, not far from them. No sign of friction between them. In another intersection, a group of old women, holding nothing, just gathering among themselves, Nepal police not far from them, not harassing them. From left: Prof. Cris Lingle, me, David Shakya and Razan Bhattarai. David and Razan are staff of Media 9, publisher of Business 360 and WOW magazines in Kathmandu, which sponsored our trip and lecture at Pokhara. The next day, there was still a strike, so we walked again. On our way to Pokhara city proper. Beautiful ice-covered mountains of the Himalayas in front of us. Very few cars, only those serving and transporting tourists are moving. Hardly any motorcycle too. Many shops were closed. A row of closed shops on those two days that we were in Pokhara. Forced closure of shops and transpo, public and private, is wrong, regardless of the political motives. Coercion and harassment is wrong. We flew back to Kathmandu January 12 afternoon. Things were normal. 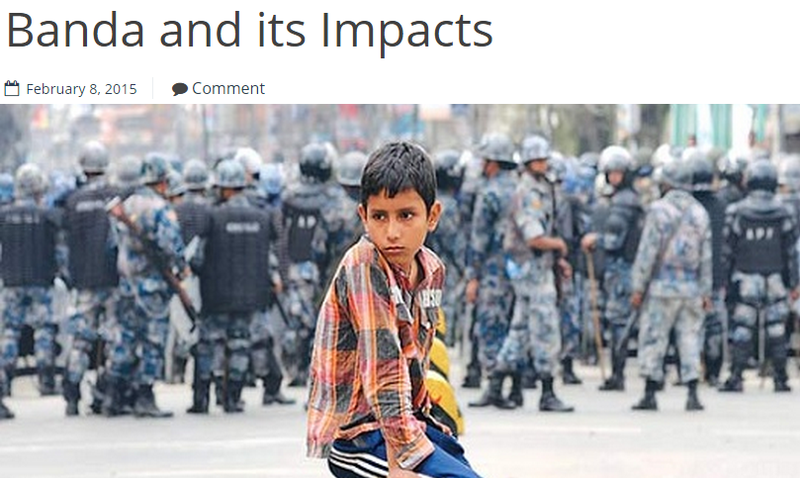 But the next day, January 13, there was a strike in Kathmandu itself. Same things -- many shops and restaurants were closed, no taxi, many roads are empty of vehicles, only some people walking although most people would stay home. I am reposting this article from Samriddhi blog, posted February 08, 2015. Samriddhi The Prosperity Foundation co-organized the Asia Liberty Forum (ALF) 2015 held at Soaltee Crowne Plaza, Kathmandu, January 8-10, 2015. I attended that conference. I am thankful to Samriddhi guys like Robin Sitoula, Arpita Nepal, Manogya Sharma, others for that fantastic, well-attended and very successful conference. “Nepal Banda” is not new to Nepal. The frequency of strikes and blockades increased with the establishment of multi-party democracy in Nepal in 1990. The CPN (UML), which was the major opposition force back then, started the culture of Nepal Banda in order to express their dissatisfaction with the ruling parties. Ever since, whenever the opposition parties disagree over a certain policy, Act or treaty, it has become fashionable among the political elites to call nationwide or regional strike thereby blocking roads, closing down educational institutions, enterprises, and other economic activities. This sort of practice has often been organized for “bringing change in the government or existing regime.” Less than a decade ago, there was a nation-wide strike called the seven major political parties against the direct rule of King Gyanendra which successfully overthrew the monarchy from Nepal relatively peacefully. The effect of strikes is most severe on those low-income groups of people who depend on their daily wages to earn a livelihood. Forceful shutdown of enterprises affects entrepreneurs and owners of all levels equally because they need to pay salary and other benefits to their workforce, in addition to having to pay rents on land and building, and interest on loans, all acquired from one financial institution or the other, whether or not there is any production at all. During Bandas, students are also deprived of their right to education in a peaceful environment. Schools and colleges fail to follow the academic calendar due to frequent protest programs. The problem becomes even worse when strikes target educational institutions by bringing issues such as banning private education, high fees in private organizations, rights of teachers, and the likes. Health sector cannot remain untouched as people who want to receive healthcare are severely affected due to unavailibility of vehicles, which is a must for carrying sick patients. It is absolutely unfortunate that it is no more news when pregnant women, injured, disabled, old and weak people die on the way to hospital. The acts of forceful strike are as severe crimes which cannot be justified at all. In Nepal, even the health workers, who are responsible for providing health service have been organizing strikes by closing hospital, health posts and clinics for several days in order to bring public attention to their demands. It is totally understandable if this fact comes as a surprise to a non Nepali. It speaks volumes about governance of our country – which is failing to deliver basic rights. Not a single section of a society is immune from the negative impacts of strikes. When strikes are elongated for several days, the entire economy of a country is completely paralyzed as it shrinks almost all economic activities, from small mom-and-pop stores to stock markets. In addition to this, such disruptions discourage investors by creating uncertainty and unpredictability. Consequently, production of goods and services are reduced and eventually distance the people from job opportunities in Nepal itself. Underproduction also causes deficit balance of payment (BoP) as the country starts to depend more on foreign products and export less and less. Moreover, it hampers revenue collection which is the backbone for overall development of the nation. Furthermore, a lot of public as well as private properties are destroyed during strikes. We have had situations where they have even cost human lives. In a nutshell, Bandas are not a civilized way of achieving any kind of demand as they hampers all activities and compel us to remain in a vicious circle of poverty. * Pramod Rijal is a Research Associate at Samriddhi, The Prosperity Foundation. He is also a lecturer of Economics at King's College and has contributed a number of articles in various national dailies.